Elvive's Arginine Resist X3 Hair Cream is the first anti-wrinkle hair styling cream specially designed for weak hair: a unique blend of arginine and probiotics: gives your hair an absolute boost and 48 hours of protection. Its stunning structure immediately penetrates hair, from roots to limbs. Deep nourishment and effectiveness against hair loss for stronger hair. Your hair is beautiful: glossy, vibrant, and perfect. Without a greasy feel or weight loss. Protects for 48 hours. Arginine is essential for hair growth. We have naturally amino acid ratios in our hair, but with age, frequent stress and diet we can reduce the proportion of arginine, which in turn causes hair to weaken and make it thinner. 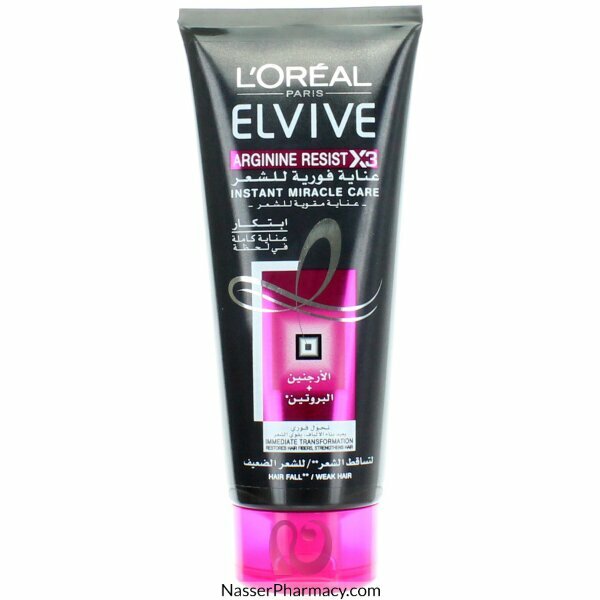 Elvive Arginine ResistX3 is enhanced by arginine and protein * to strengthen the hair to withstand more resistance to fall. This structure activates blood circulation in the vessels at the roots to facilitate the process of passing nutrients around the hair follicle. 95% of women noticed the difference.